Grilled bread or λαδοβρεχτό is the simplest way to enjoy a loaf of good bread. The bread needs to be not too crumbly nor too mushy. You need good, thick slices to soak up the simple flavours. Whilst the bread is grilling crush some dried oregano. Turn the bread around as it grills so it is evenly golden brown. It wants to toast quickly so as to make the outside crisp but keep the inside soft. Then straight from the heat, brush each piece generously with extra virgin Greek olive oil, the oil that is almost green in colour. It makes a big difference if you do this immediately after taking the bread from the grill as the outside remains crisply toasted but the flavour of the olive oil soaks inside. Sprinkle with coarse sea salt and the oregano. It is unbelievably tasty and could not be any easier. It is also good with crushed basil or roasted garlic, and if there are tomatoes on the vine pick them, dice finely and add as a topping. July 11, 2015 in Recipes. That sound delicious. 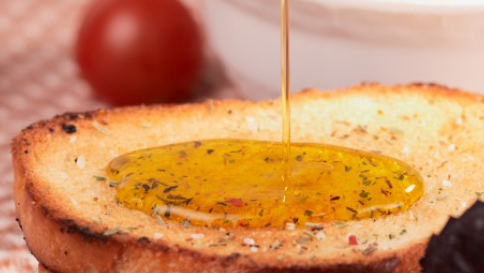 At many Italian restaurants, there is a saucer of virgin olive oil with sautéed garlic and spices. Each table is given small loafs of bread which is pulled apart by hand and dipped into the saucer. I bake my own bread each week – so I’m going to try your version with the next baked loaf. Thanks for this tasty idea. I have this for breakfast quite a lot. It is delicious. Always wondered how they get it to stay so.crispy…mine always end up.chewy! Now I know…thanks! As well as chopped (cherry) tomatoes, I added some crumbled feta, then sprinkled on more oregano & drizzled more extra virgin olive oil. Quite a simple feast!